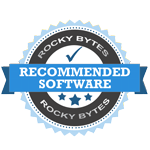 "Makes sure your security software is installed and up to date on your PC." 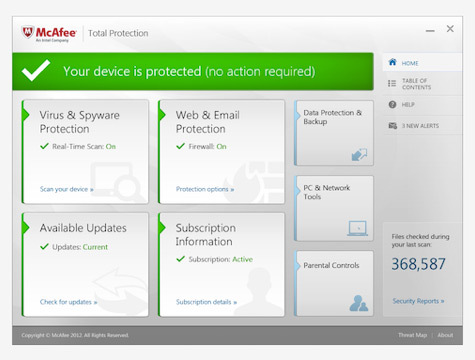 Make sure your computer has the proper protection to maintain your security with McAfee Security Scan Plus. This application's purpose is simply to make sure that you have anti virus software installed, firewall protection, proper web security, and detects potential threats with the open programs you are running on your system. It also makes sure all of these applications are up to date. The application is designed to make sure your computer has optimal protection running in the background to maximize your security. 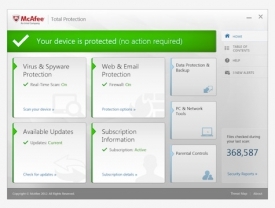 McAfee knows that your security is important, so this is why they provide a simple utility to make sure the protection you are running on your computer is adequate enough. Though, do not confuse this with anti-virus software. This is not a virus scanner, nor does it actively protect you from viruses. All this application is designed to do is make sure that your security applications are doing their jobs by protecting your PC, and that they are all up to date. This application can come in very handle for novice users that are unsure whether the protection they are running on their computers are satisfactory for daily Internet usage. However, for more veteran users McAfee Security Scan Plus can ensure that their security application are always up to date without having to look at each of these individually. This is a good way to make protecting yourself a lot more simple, yet still effectively ensuring your own security. The name of the application, "McAfee Security Scan Plus", can be a bit misleading to some since most people will assume this is a free virus scanner. However, that is not the purpose of this application as it does not scan for viruses, but is for scanning the security applications running on the computer. This application can run in the background and notify you if anything security related is out of date and needs your attention. This makes sure you update these security applications right when updates come out to get the latest protection even faster. Keep tabs on your security today by installing McAfee Security Scan Plus and get up to date right when updates come out with the watching eye of McAfee.